In Reciprocating Internal Combustion engines, it is the measure of the capacity to do the work. 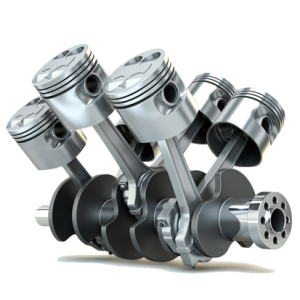 The Mean effective pressure means the simply average pressure acting on the piston during the complete thermodynamic cycle in a Reciprocating internal combustion Engine. As we said it is an average pressure acting on the piston during the complete thermodynamic cycle in a Reciprocating internal combustion Engine. There are different Mean Effective Pressures that we need to understand completely. Those are listed below. The Indicated Mean Effective Pressure is the average pressure, that induced in the combustion chamber during the complete thermodynamic cycle in Internal Combustion engines. In here we will have two more different Indicated Mean effective pressures. Those are Gross Indicated Mean Effective Pressure and Net Indicated Mean Effective Pressure. It is the average pressure in the cylinders during the Compression and the Expansion Strokes only. Not the complete Thermodynamic cycle. But where the Net Indicated Mean Effective Pressure is the average pressure in the cylinders during the complete Thermodynamic cycle. This Indicated Mean Effective Pressure can be obtained by a direct measurement such as a cylinder pressure sensing Equipment is required to measure this. The difference between the Net Indicated Mean Effective Pressure and the Gross Indicated Mean Effective Pressure will give the Pumping Mean Effective Pressure (PMEP). 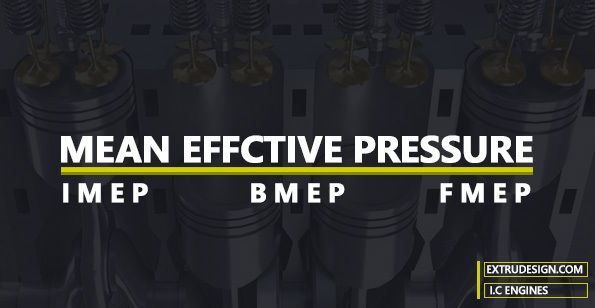 Unlike the Indicated Mean Effective Pressure (IMEP), we can calculate the Mean Effective Pressure from the torque generated at the crankshaft. The torque generated at the crankshaft is called the Brake Torque. So the Mean effective pressure calculated from the Brake torque is called the Brake Mean Effective Pressure. We can understand that the Mean Effective pressure at the cylinders (IMEPn) and the Mean effective pressure (BMEP) calculated from the brake torque are different. In fact, the Mean effective pressure (BMEP) calculated from the brake torque is less than the Mean Effective pressure at the cylinders (IMEPn). Because of the friction losses. Well, now we have a full understanding of Mean Effective Pressure terminology. Let’s see how we can calculate them with the different parameters. How to calculate the Mean Effective Pressure? Generally, Mean Effective Pressure can be calculated from work done by the engine and the engine displacement. We can write the above equation in terms of the power or torque also. For an engine with multiple cylinders, we have to take into account the total volumetric capacity. How to Calculate IMEP, BMEP, and FMEP? This is how we can calculate the different mean effective pressures. **Note: The Mean effective pressure is an Engine performance parameter to determine the engine performance and does not reflect the actual pressures inside an individual combustion chamber. Sample problem: A 4 cylinder 4 Stroke diesel engine having 84mm of piston bore and 90mm of stroke length and the effective torque of 175 Nm and the indicated torque is 193 Nm. Please calculate the IMEP, BMEP, FMEP and mechanical efficiency? Calculate and post the answers in the comment section below. We will send you the answers. We have discussed the mean effective pressures and different types of it such as IMEP, BMEP, and FMEP. and we explained the derivation of the MEP formula. Please let us know your thoughts in the comment section below.